At last year’s Annual Meeting in Washington, DC, I was honored to obtain my AHRA Fellow designation. I consider this a great accomplishment and one I will treasure throughout my lifetime. When I first joined AHRA, my first goal was not to work toward achieving my Fellow status. I joined AHRA because radiology management was a great passion of mine, and I wanted to grow and learn more about my profession. I can remember attending my first Annual Meeting in 2009 in Las Vegas, NV. I attended as a proud recipient of the Osborn Scholarship. I have to admit, I was very nervous about attending. At that time, I was an MRI chief technologist with minimal training in radiology leadership. I thought I was going to be surrounded by radiology administrators who would not even waste their time speaking to a newly minted chief technologist. It did not take me long to realize that this is truly not what AHRA is all about! Everyone was very helpful, friendly, and kind. I had the opportunity to network with a variety of administrators, many of whom were considered experts in their field. I came back with a renewed sense of what AHRA is all about: helping to better our profession by helping one another. Going to my first Annual Meeting inspired me to volunteer for more AHRA activities. As time went on, I was privileged to volunteer on the Editorial Review Board, the Fall Conference and Annual Meeting Design Teams, and the Membership Committee, among others. 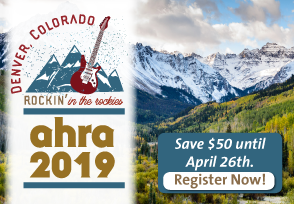 Furthermore, I had the pleasure to speak at numerous AHRA meetings, wrote articles in Radiology Management and Link, won Radiology Management’s Outstanding Article Award, and earned my CRA, amidst other accomplishments. In early 2014, I read the criteria to obtain the AHRA Fellow designation. After reading this, I thought that I probably had enough credits to achieve this honor. After completing the required paperwork, I realized that I had more than enough credits! Needless to say, I was very humbled when I received my Fellow at last year’s rewards reception. The honor was even more memorable because I was surrounded by other Fellows who I have a tremendous amount of respect for. If you have been an active member of AHRA, I would highly encourage you to apply for your Fellow. There are many people who have made significant contributions to AHRA within their radiology career. Receiving the honor of adding the initials “FAHRA” after your name will further boost anyone’s credibility within our beloved profession. Jason (left) receiving his Fellow designation at the 2014 Annual Meeting with other Fellow recipients Brenda DeBastiani, Bruce Hammond, and Jason Newmark. Jason Scott, MBA FAHRA CRA RT(R)(MR) is the chief patient experience officer and director, imaging/cardiac diagnostics/pulmonary/neurodiagnostics/wound care at Witham Health Services in Lebanon, IN. He can be reached at jscott@witham.org.